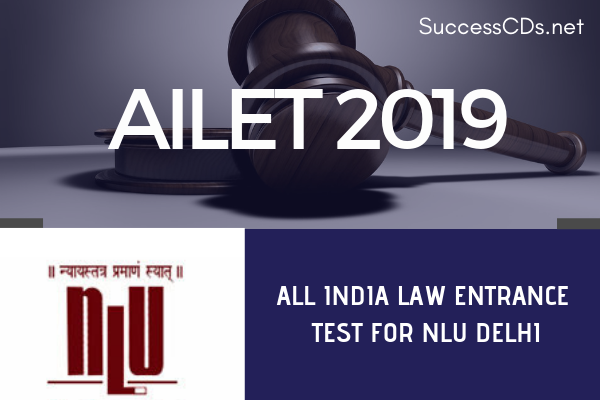 The aspirants can check complete details on AILET 2019 Application Form including the complete process to apply, eligibility criteria, fee, total seats etc. from this page are given below. Eligibility: Senior Secondary School Examination (10+2 System) or Equivalent Examination with 50% marks. The candidates appearing in the 12th standard examination in March/April 2019 can also apply. Eligibility: LL.B. or an Equivalent Law Degree with 55% marks (50% in case of SC/ST/ Persons with Disabilities). The candidates appearing in final year LL.B. Examination in April/May 2019 can also apply. Total Seats: 80 [70 Seats on merit through All India Law Entrance Test (AILET) and 10 Seats for direct admission to Foreign Nationals on merit (5 seats for Foreign Nationals & 5 seats for OCI/PIO)]. Foreign Nationals are exempted from AILET (No. of seats may vary). Number of Seats: 08 Seats (No. of seats may vary). Admission to B.A. LL.B. (Hons. ), LL.M. and Ph.D. Programs will be through AILET to be conducted at Bangalore, Bhopal, Chandigarh, Chennai, Cochin, Cuttack, Delhi, Gandhinagar, Guwahati, Hyderabad, Jaipur, Jammu, Jodhpur, Kolkata, Lucknow, Mumbai, Nagpur, Patna, Raipur, and Varanasi on May 5th, 2019 (Sunday). Interested candidates should apply only online on payment of Rs.3050/- (Rupees Three Thousand Fifty Only) for General Category Candidates, Rs.1050/- (Rupees One thousand Fifty only) in case of SC/ST and Persons with Disabilities (PD) along with copy of requisite Caste/Persons with Disabilities Certificate. Below Poverty Line (BPL) applicants of SC/ST Category are exempted from application fee. For further details relating to Application Form, Eligibility Criteria, Pattern of Entrance Test etc. visit University Website http://www.nludelhi.ac.in. The candidates should apply only online for admission through: http://nludelhi.admissionhelp.com, http://www.nludelhi.ac.in up to April 08th, 2019. The admit cards will be available online w.e.f. April 22nd, 2019 on the above websites. Note: The reservations for admissions are subject to any decision by the Govt. of NCT of Delhi and NLU Delhi.